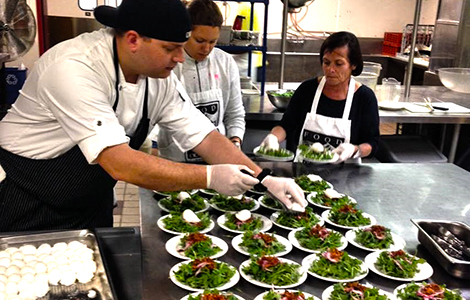 Each Monday (except for national holidays) Food Outreach invites our clients and their guest to join us for a three-course, restaurant-style meal served hot and fresh in our dining room. This weekly commitment allows clients to enjoy a delicious meal prepared by our chef and guest chefs from local restaurants, as well as a regular opportunity to socialize and foster friendships with people who can share their experiences. Periodically, following lunch, discussions about various health topics relevant to those living with HIV/AIDS and cancer offer an additional opportunity to gain new information and insight. You can sponsor a Hot Monday Lunch for only $300. Please contact Marcia Whelan at 314.652.3663 ext. 118 or marcia@foodoutreach.org for more information. We love to welcome culinary crews from around the area to prepare their favorite dishes for clients to enjoy for Hot Lunch Mondays. To participate, you can be a chef, restaurateur, caterer, or simply someone with a passion for cooking! These special lunches give clients a rare opportunity to experience some of the culinary delights they otherwise might only hear about.